The Diocese of Gaylord and Holy Family Parish require that parents be properly formed and prepared for both living out the commitment they are making to raise their baptized child in the Catholic faith and for being able to celebrate the Sacrament of Baptism with understanding. The first step is to contact the Parish Office 989.362.3162. The exception of course is in extreme, life and death circumstances where there is no time for preparation and formation. First and foremost, all parents must make note that in order for your child to be baptized at Holy Family Parish you must have completed our preparation process (3 phases) After the period of formation and preparation, you may then schedule your child’s Baptism, provided that all required documentation is received. Baptismal preparation at Holy Family Parish is required for the first child to be baptized at these parishes. For example: if your first child was baptized somewhere else and now you wish you have your second child baptized here you are still required to go through the formation process with us. What is Baptism Preparation like at Holy Family Parish? After parent(s) have completed all three phases, they can then contact the Baptism Coordinator 989.362.3162 to schedule their child’s Baptism. Can I have my child baptized if I am not a registered parishioner at Holy Family Parish? Yes. You don’t have to be registered at the parish, especially if you live out of the Tawas area, but still have some connection to our parish. However, if you do live in the area we do ask that you consider registering with the parish office. It helps all of us to get to know each other better and be part of the Catholic community. 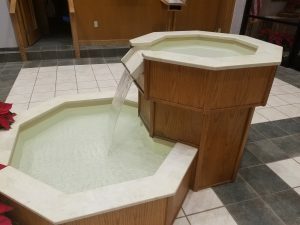 As long as parents have completed Baptism Formation Process at Holy Family Parish for their first child, then the parents will not need to attend the program again. However, phase one (Initial Visit) would still be necessary. I am to be a godparent at another church that requires classes. Can I take godparent classes at Holy Family? Because Holy Family Parish does not require its godparents to attend classes we do not offer godparent classes. However, parishioners are welcome to go through the online course and attend one of our Baptism Formation Encounters after which you will be provided with a “Certificate of Completion” to be presented to an outside parish. It can take up to 3 months after the child is born to receive the birth certificate. If you do not yet have a birth certificate, please provide us with the Birth Verification Facts that you received at the hospital. Upon obtaining the birth certificate, please email a copy to the parish office [holyfamily@hf-sh.org]. A copy of a state issued birth certificate for children older than 3 months must be in the parish office prior to scheduling the baptism.